The Wednesday, May 29 Pennsylvania Avenue Plan meeting was well-attended by those concerned about the safety transportation corridor, in particular, bicyclists who use the street's center-aligned bike lanes to travel east and west within the District's downtown core. However, according to the meeting’s National Capital Planning Commission (NCPC) presenter, the meeting wasn’t about bike lanes. Instead, the meeting discussed the alternatives to the current management structure of the Pennsylvania Avenue National Historic Site plan. Under section 106 of the National Historic Preservation Act, the National Park Service must also hold this consultation meeting to discuss if proposed changes will have an impact on the historic resources of the site. While this issue appears less than what bicyclists hoped, it actually provided an opportunity to discuss the corridor and provide suggestions as to how the street could be more inviting to its visitors and residents. 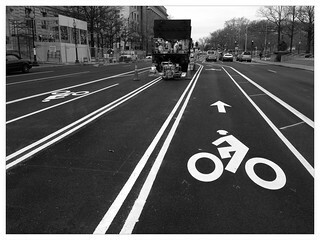 The District controls the street, not the sidewalks, of Pennsylvania Avenue and may make certain bicycle safety or other roadway improvements; however, it is required to consult with NPS and other entities to insure that historical elements are maintained. The National Park Service (NPS) controls most of the side walk along the Avenue. They acknowledge that there is no bicycle parking along Pennsylvania Avenue and will use the upcoming process to both add bike parking, replace the outdated street furniture and provide maintenance of the sidewalk through the DowntownDC Business Improvement District. The Commission on Fine Arts (CFA) advises the National Capital Planning Commission and the District pursuant to the Shipstead-Luce Act.While only advisory, NCPC and the District rarely act unilaterally against a CFA disapproval. The National Historic Preservation Act Consultation Update to the Consulting Parties document supports the installation of Capital Bikeshare stations along the Avenue. Please see the Washcycle article "NPS says that Pennsylvania Avenue is "DC's jurisdiction", for more details about what bicyclist said at the meeting. The meeting attempted to addressed the complicated relationship between the parties that have jurisdiction over the street by creating alternatives to the current management of the avenue and addressing the current jurisdictional ambiguity; the meeting reinforced the desire to insure that the avenue maintain its historic character. The entire process is part of in initial environmental assessment The plan also includes the Interagency Streetscape Manual, which provides extensive details on how the Avenue should be constructed. Many of the jurisdictional problems are derived from the dissolution of the Pennsylvania Avenue Development Corporation (PADC) in 1996. Established in 1973, the PADC created the Pennsylvania Avenue Plan in 1974 and implemented it over the next 20 years. The PADC purview included assessing the quality of the buildings along the Avenue ensuring that they maintaining the "historic character" of the Avenue and the development of street structures to include sidewalks and street furniture. Once the rebuilding was completed, control of the avenue fell to several different entities. National Park Service - Controls sidewalks, plazas and parks; affects commercial activities and permitting. District of Columbia - Jurisdiction over road or carriageway. This includes entities that act on it's behalf (Office of Planning, District Department of Transportation, Department of Public Works, etc.). General Services Administration - Jurisdiction over the buildings it controls along the avenue; buildings primarily south of avenue, plus FBI to north; increasingly mixed use federal and commercial sites. National Gallery of Art - Controls the frontage of 5th Street and Pennsylvania. (Will soon transfer ownership from government to create a new hotel). Commission on Fine Arts – has an advisory role to review the changes approved by the entities with functional control. National Capital Planning Commission - Ensures that the development of the Avenue conforms with the 1974 PADC plan. Other entities also have an interest or influence on Pennsylvania Avenue ranging from the National Trust for Historic Places to the FBI. As part of the process, these groups along with others, began meeting in 2006 to determine how best to manage the street. Along with comments from the public, general comments included providing signage, public restrooms, retaining the street's historic character and better integration with the surrounding area. Important for bicyclists, stackholders also wanted to improved bicycle access along the avenue, which lead to the development of the current bicycle lanes. The NPS presentation provided alternatives to create a better system of management of the Avenue. Draft Preferred Alternative (Option 2): NPS maintains most sidewalk jurisdiction, but simplifies management through the BID – Requires update of 1996 MOA. Once the alternatives were presented, the meeting quickly focused on the NPS preferred alternative, which proposed that the BID manage the day-to-day maintenance of the Avenue. In the submitted remarks of Richard Reinhardt, the BID Deputy Executive Director, the BID has discussed the prospect of the preferred alternative with Avenue property owners were supportive of the prospect. NPS has provided a website for comments with regard to the historical aspects of Pennsylvania Avenue. Providing comments regarding bicycle safely may not be included in this report but it will show that it is an important factor in future development of the Avenue. The comments section closes Thursday, June 13, 2013. The next steps in the environmental assessment will likely begin in late summer. Please feel free to leave a comment below.